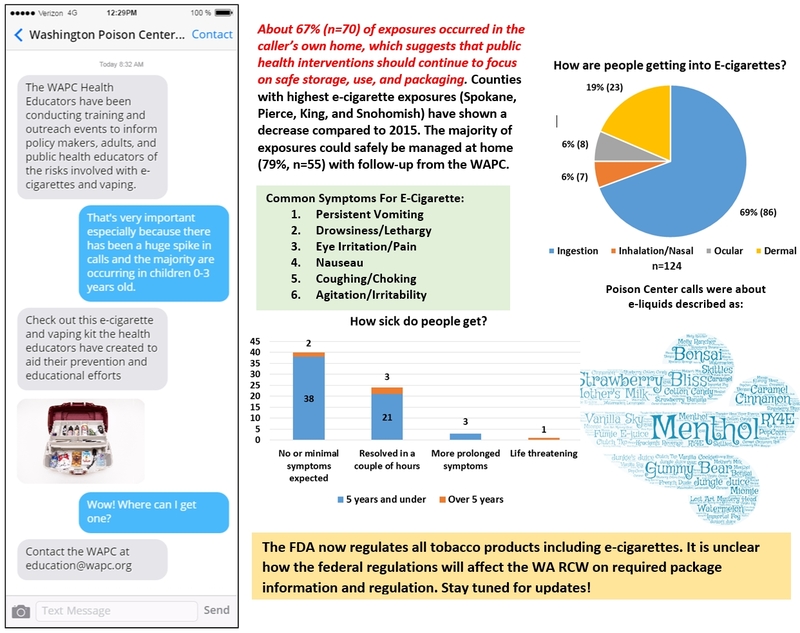 The Washington Poison Center (WAPC) saw a decrease in the total number of calls related to e-cigarette exposures in WA in 2016 (n=104) compared to 2015 (n=152). WAPC continues to implement public health interventions for prevention of unintentional toxic exposures and promote public awareness of their dangers with unsafe use. Despite the overall decrease in calls, children ages 0-3 years are still disproportionately affected and account for about 82% of the total cases. *Disclaimer: Reporting of exposures to the poison center is voluntary and not mandated by law. As such, WAPC data describes the number of calls called into the poison center and most likely is an underrepresentation of the true occurence of any one substance. All calls to the Washington Poison Center are free and confidential.For further information, contact Dr. Garrard at AGarrard@wapc.org or 206-517-2356.